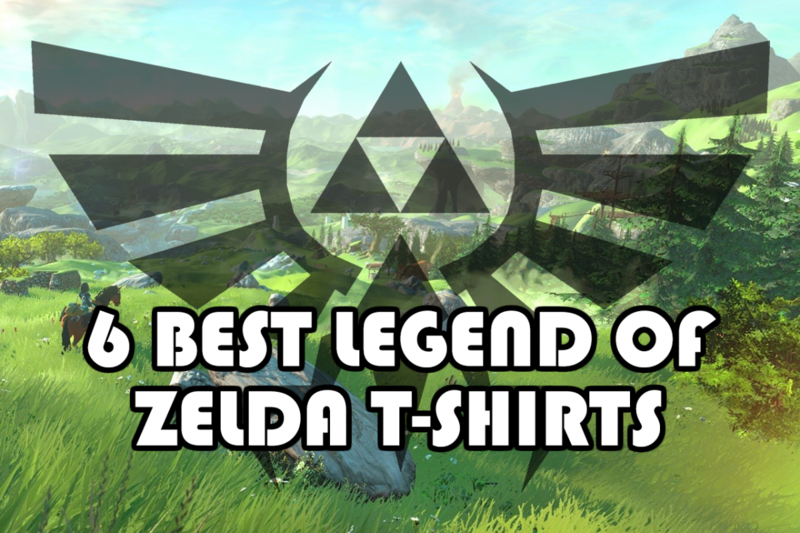 Here is our round up of the very best Legend of Zelda T-Shirts available online. 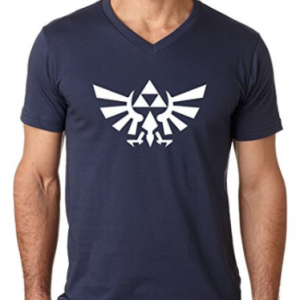 Everything from Link based tees to more minimalistic logo designs – there’s something for any Legend of Zelda fan in this list. This Zelda pocket Link tops our list as it allows you to take your own mini pocket Link with you wherever you go! The incredibly artistic tee is a break from the norm and utilises a faux pocket perfectly. 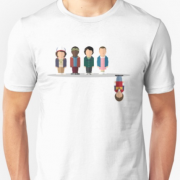 Click below to buy from Redbubble now. 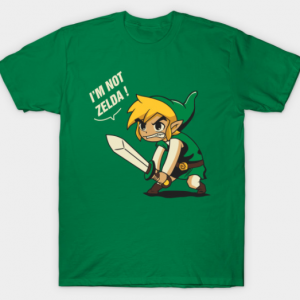 This Zelda T-Shirt captures any Legend of Zelda fan’s exasperation at everyone thinking that Link is called Zelda. Fight in Link’s corner and let the world know that he’s not called Zelda! 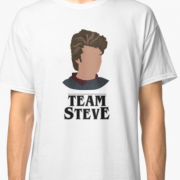 Click below to buy from Teepublic now. 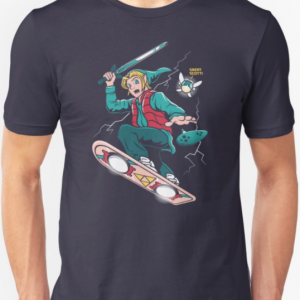 A fantastic mash-up between Link and Marty McFly in this Back to the Future themed tee. The legend of Zelda goes back to the future! Link’s hyrulian shield becomes a hoverboard and Navi takes on the role as Doc Brown. Re-live your N64 days and get out that Ocarina one last time. 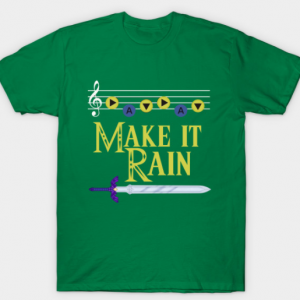 A perfect reproduction of the Song of Storms – make it rain! 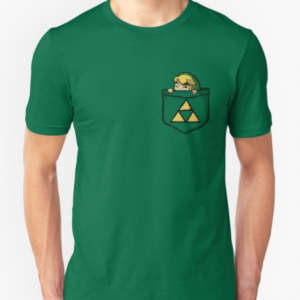 Taking a break from the busy designs, this fantastic minimalistic hyrulian coat of arms and triforce make for a stunning bold Legend of Zelda tee. Click below to buy from Amazon now. 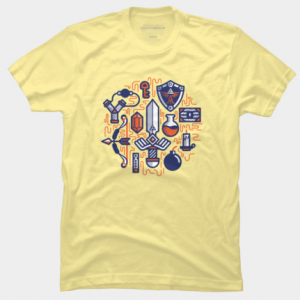 This Zelda Essentials T-Shirt takes everything you know about Link and throws it all into one amazing collage that covers everything from his sword and shield, to heart pickups and gems. Show the world everything Link has to offer! 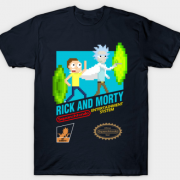 Click below to buy from Design By Humans now. 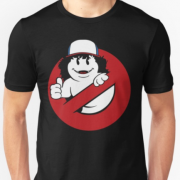 This entry was posted in T-Shirt Collections. Bookmark the permalink.